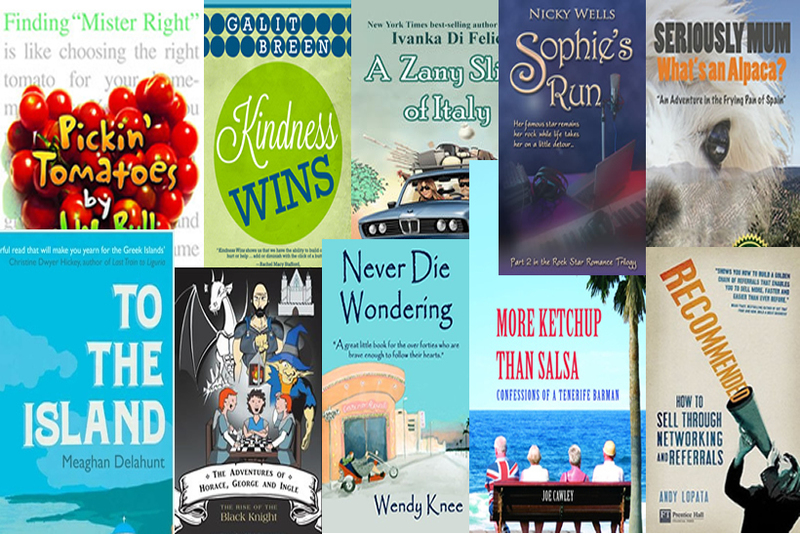 How many books could a new author actually sell? Way back in 2007 I ran a workshop on behalf of a local organisation called Creative Dorset for authors and those who were hoping to publish a book. 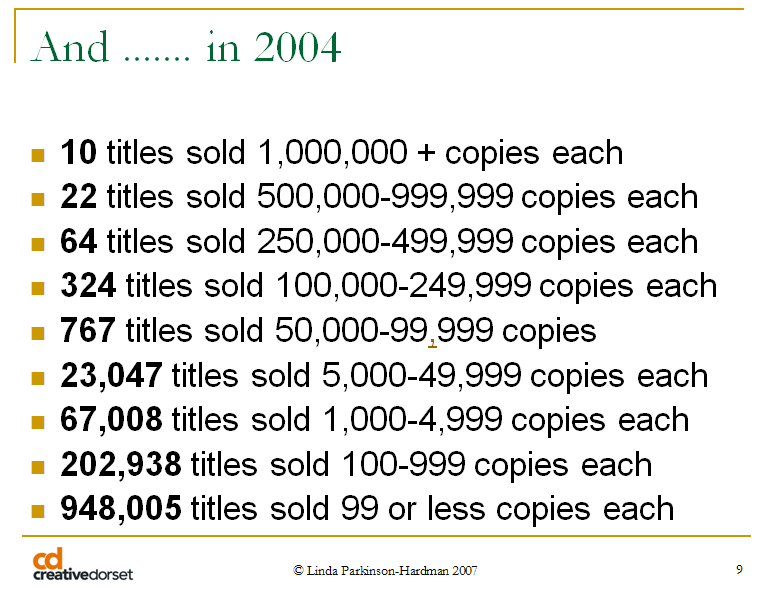 During the course of the mornings proceedings I shared a slide in the presentation that I had put together from the data Nielsen had released about the numbers of books that sold in 2004. I have tried to find any updated information from Nielsen but it seems they have yet to repeat the process but I suspect, after more delving around, that the figures may look even worse than they do below. It’s right though, the average books sold fewer than 99 copies in 2004 and according to Bowker and other industry sources that figure seems to be dropping – down to about 52 at present, although this can’t be confirmed by any actual statistical data that I can find at the moment. However, we do know that in the US over 1,000,000 books were published in 2010 and according to the US Publishers Weekly the average non-fiction book in the US sold less than 250 copies in 2010 and sold less than 3,000 copies over it’s lifetime. I’d be happy as one of the 324 🙂 Then I could work my way up to one of the 10. I have really super-duper rose-colored glasses, I know, but I like it that way. LOL. Well, I know it won’t be much worse for me, that’s for sure. I’ve seen writer friends go through such excitement because they’d signed with a small press and wait wait wait for that magical release date and then… nothing. The only people who know of their books are the friends they’ve shared all the excitement with and at most that circle of friends covers the writer’s groups in the tri-state area. Even if they have blogs and make attempts to learn Twitter. I’m reaching out way beyond that with my effort, and my efforts are multi-pronged in approach, but only time will tell if it has helped or not. If nothing else, I’ve had a hell of a good time making friends all over the world, LOL. 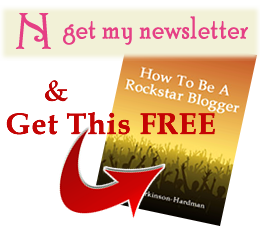 That’s true Madison – but, as a result of your efforts I’ve found your blog and your Facebook page and am now following both and I will be sharing things from both with the people who follow me. Without the work you do that wouldn’t have been possible and let’s face it, you are consistent, most people (and businesses) try things for a couple of months and when they don’t get instant results say it doesn’t work and so go on to to the next thing instead of sticking with the momentum they are building.